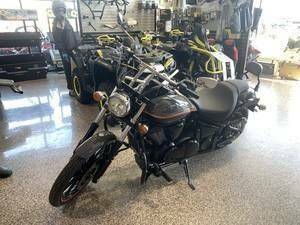 Could you provide more information about this 2019 Kawasaki Vulcan 900 Custom? RIGHT OFF THE SHOWROOM FLOOR, THE KAWASAKI VULCAN 900 CUSTOM V-TWIN HAS ALL THE STYLE AND ATTITUDE OF A ONE-OF-A-KIND CRUISER. WITH ITS TALL FRONT WHEEL, DRAG-STYLE CHROME HANDLEBARS AND LOW-SLUNG SEAT, THE APPEARANCE OF THIS KAWASAKI V-TWIN STANDS IN STARK CONTRAST TO ITS SMOOTH RIDE AND STEADFAST RELIABILITY. ENJOY THE DYNAMIC FUSION OF HAND-BUILT DESIGN AND PRODUCTION QUALITY WITH THE VULCAN 900 CUSTOM. Vehicle Network, LLC - Performance East, INC. Contact Vehicle Network, LLC - Performance East, INC.
What is the price of the 2019 Kawasaki Vulcan 900 Custom you have in your inventory? What is the mileage of the 2019 Kawasaki Vulcan 900 Custom you have in your inventory? I was wondering if this 2019 Kawasaki Vulcan 900 Custom is still available? Call Vehicle Network, LLC - Performance East, INC.